The 2016 presidential election coincided with substantial shifts in the ways that members of Congress communicated with their constituents online. A new Pew Research Center analysis examines congressional Facebook posts from Jan. 1, 2015, through Dec. 31, 2017, a three-year timespan that includes the entire 114th session of Congress, the 2016 primary and general elections, the first year of the 115th Congress, and Republican President Donald Trump’s first year in office. The analysis finds that Democrats expressed political opposition nearly five times as much under Trump as they did during the last two years of Barack Obama’s presidency. Much of this opposition was directed at President Trump, though Democrats also increasingly opposed Republican members of Congress. Political opposition and political support refer to statements made by members of Congress on Facebook that oppose or support the actions, decisions or positions of political actors and groups. This report examines support or opposition directed toward Donald Trump, Barack Obama, Hillary Clinton, Democrats or liberals, and Republicans or conservatives. Researchers determined whether or not individual posts expressed opposition or support by classifying a set of posts manually and then training a machine learning model to classify the rest. Researchers classified whether posts expressed both opposition to some figures or groups and support for others, but did not classify both support and opposition directed at the same figures or groups. Local issues refer to references within congressional statements to any place, group, individual(s) or event in the politician’s state or district. Researchers determined whether or not individual posts discussed local issues by classifying a set of posts manually and then training a machine learning model to classify the rest. DW-NOMINATE is a measure of political ideology that places members of the U.S. House and Senate on a liberal-to-conservative ideology scale according to their roll-call voting history in each legislative session of Congress1 The scale ranges from -1 (very liberal) to 1 (very conservative) across all Congresses. For the time period studied here, it ranges between -0.77 and 0.99. Very liberal and very conservative legislators are defined as those with DW-NOMINATE scores in the furthest left 10% and furthest right 10% of all DW-NOMINATE scores. Moderates are defined as legislators with DW-NOMINATE scores in the middle 20% of all scores. Engagement on Facebook refers to “likes,” “comments” and “shares,” as well as specific reactions, such as “angry.” On the Facebook platform, these digital actions provide users a means for interacting with posts created by members of Congress. Members of Congress who expressed political opposition most often were also the most liberal or conservative.3 This pattern is in line with the Center’s previous research on how members of Congress express political disagreement. But the new analysis also shows that the most ideological members were also the most likely to express support for others in their party. In other words, the most liberal and conservative members of Congress both attacked those on the other side more often and were more likely to affirm their own side’s decisions and positions. Moderates, meanwhile, tended to focus most of their posts on local issues. Changes occurred not only in what members posted, but also in how their online audiences responded. The Facebook audience increasingly expressed angry reactions when responding to congressional posts. In early 2016, Facebook introduced alternatives to the traditional “like” reaction – and between late February 2016 and Election Day, just 2% of all reactions to posts used the “angry” option. But by the end of 2017, 9% of all reactions to posts by Democrats and 13% of reactions to posts by Republicans were angry. 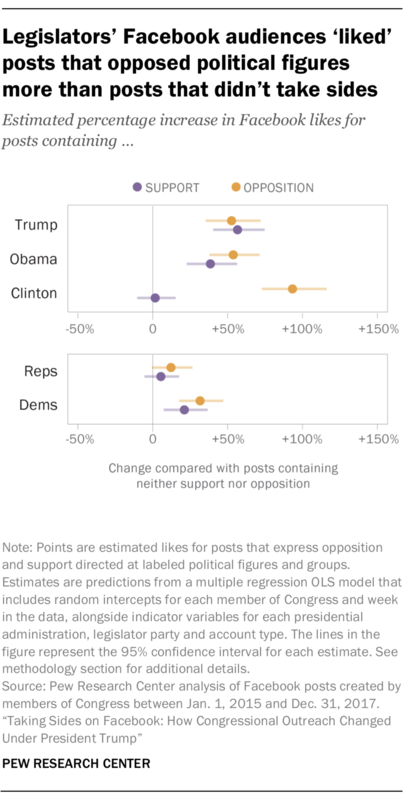 Nearly universally, both supportive and oppositional posts about Trump or Obama drew more engagement – including likes, comments and shares – than posts about other topics. But the pattern was somewhat different for Hillary Clinton. Congressional posts that supported her drew the same number of likes as posts that did not take sides either way, while posts opposing her received 93% more likes on average – the largest increase in likes across all the kinds of posts examined here. 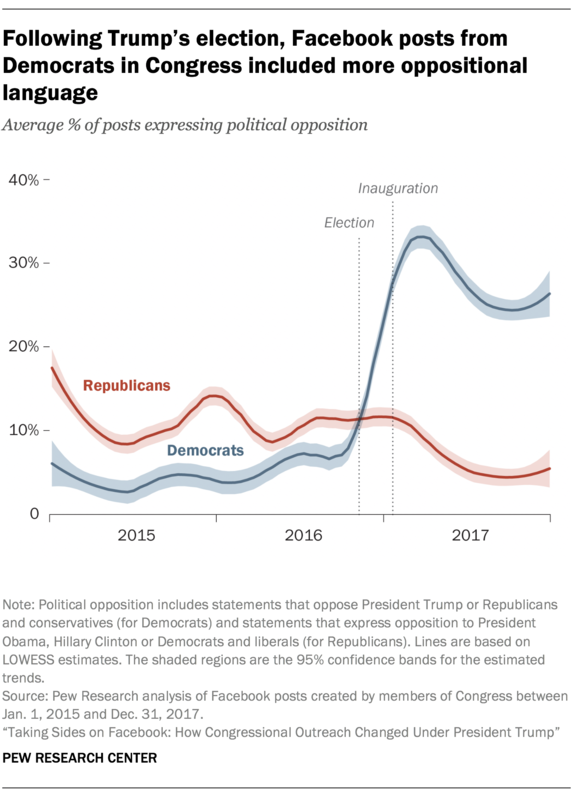 Change of tone for Democrats after Trump took office: Following Trump’s inauguration, the share of Democratic legislators’ Facebook posts that included oppositional language – defined here as posts that oppose or disagree with the actions, decisions or positions of Trump and his administration or Republicans and conservatives – peaked in March 2017 at an average of 33% of all of their posts before ramping down to 24% toward the end of the year. That compares with an average of 12% of Republican lawmakers’ posts expressing opposition to Democrats and liberals or Obama during the last two years of his presidency. Democratic opposition during Obama’s presidency – at that point mostly aimed at congressional Republicans – appeared in just 6% of their Facebook posts. Republicans expressed more support for Trump in his first year than Democrats did for Obama in the previous Congress: Just 4% of the average congressional Democrat’s Facebook posts from January 2015 through December 2016 expressed support for Obama. In contrast, the average Republican member expressed support for Trump in 9% of their Facebook posts in 2017. After the election, the Facebook audience was far more likely to use the “angry” reaction to respond to outreach: Between Feb. 24, 2016 (when the reactions were first made available to Facebook users) and Election Day, 2% of all Facebook reactions to congressional posts were angry. But after the election through the end of 2017, that share tripled to 6%.4 By December 2017, the average was 9% for posts by Democrats and 13% for posts by Republicans. Members of both parties focused more on Clinton than Trump during the 2016 campaign: Both presidential candidates drew modest attention from members of Congress on Facebook, and then-candidate Trump received less support from members of his party than Clinton did from hers. Between each party’s convention and Election Day, Democrats in Congress posted in support of Clinton substantially more often (a total of 1,614 posts) than Republicans posted in support of Trump (a total of 690 posts). However, Republicans opposed Clinton in 2,041 posts, far more than Democrats expressed opposition to Trump (1,383 posts). Moderates went local, while very liberal and very conservative members took sides: Moderates in Congress were less likely to express political support or opposition than were very liberal or conservative members. The majority of moderates’ outreach focused on local issues (54%, compared with 38% for the most liberal or conservative members). Those in the middle of the ideological spectrum issued statements of political support and opposition about half as often as those on either end of the ideological spectrum. More online followers engaged when elected officials took sides, especially when opposing individuals on the other side: Across the full time frame of the study, congressional posts that opposed Obama, Trump or Clinton earned more likes, comments and shares than posts that didn’t take sides either way. Posts that expressed support for politicians also received more engagement some of the time, but the pattern was not always consistent. This analysis is based on 737,598 Facebook posts issued by 599 members of Congress between Jan. 1, 2015, and Dec. 31, 2017. The total number of legislators is greater than 535 (the current number of voting officials in the U.S. House and Senate) because members who were newly elected in the 115th Congress or in special elections are included in the study, as long as they produced at least 10 posts within a given Congress. 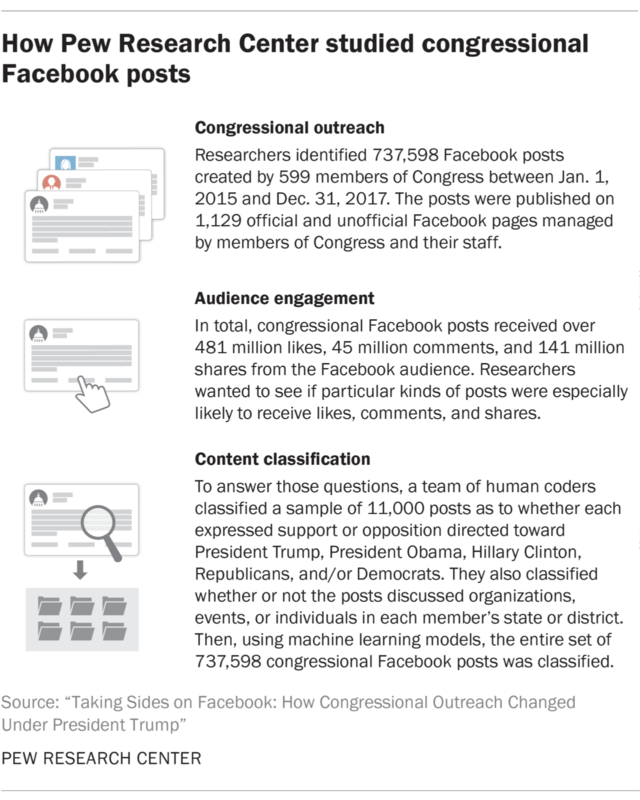 Researchers included both official Facebook accounts (those managed by congressional staff) and unofficial accounts (those used in a personal or campaign capacity) for members of Congress in this analysis. They did so in order to capture a more complete range of outreach on social media than would be possible with official accounts alone. As a result, the study includes a total of 1,129 accounts belonging to the 599 individual legislators. Official accounts are used to communicate information as part of the member’s representational or legislative capacity, and U.S. Senate and House members may draw upon official staff resources appropriated by Congress when releasing content via these accounts. Unofficial accounts – often used in a personal and campaign capacity – may not draw on these government resources under official House and Senate guidelines. Members posted more often on official accounts across the study period: 76% of the average member’s posts came from their official account (for Democrats, the share was 78%; for Republicans, it was 75%). To classify the posts, Pew Research Center manually analyzed a subset (11,000 total) of all the posts, classifying each post’s contents for the events, topics and issues raised or discussed in each one. Specifically, the analysts coded each post based on whether it expressed disagreement with presidents, candidates or parties; expressed support for the same; or mentioned local events, places or people. Next, researchers trained machine learning algorithms to make predictions – based on what the human coders reported – in order to classify the content of the entire set of posts. Each set of particular kinds of post – those labeled as opposing Obama, or supporting Republicans, for instance – was used as a “training dataset” for separate machine learning models. Those models used the human decisions about what words convey political support or opposition as a guide for determining how to classify the remaining posts that human coders did not read and classify. This approach builds upon previous Pew Research Center work that examined similar kinds of rhetoric in congressional statements. Performance statistics and additional details are provided in the methodology. While Facebook is one important part of members’ media outreach efforts, members also communicate with their constituents through press releases, town hall meetings, media appearances and on other social media outlets. Although this report does not examine communication across all these channels, Facebook posts constitute a useful way to compare members’ communication, as they can be systematically captured and analyzed. Previous research suggests that statements that members of Congress express on Facebook are similar in many ways to those they make in press releases. Focusing on Facebook posts also makes it possible to measure how much a member’s audience interacts with their posts via likes, comments and shares. Facebook is the most widely used social media website (excluding YouTube) and the social media site from which most Americans get news.